Assailants slit the throats of a mother and her three children Wednesday in southern Iraq where the family had fled to escape threats that they had cooperated with the Americans, police said. The mother's sister was also slain in the savage attack, which occurred in an apartment the southern city of Basra, police said. Five other family members were rescued before they could bleed to death, police said. Officials said the family had fled Baghdad for Basra after receiving threats because they had cooperated with the Americans. The officials gave no further details and spoke on anonymity because they fear reprisals by sectarian militias that have infiltrated Basra's police. At least 31 people were killed Wednesday, including one Iraqi who died when two rockets struck the heavily fortified Green Zone, where the U.S. and British embassies are located. Two other Iraqis were injured in the attack, the U.S. military said. Prime Minister Nouri al-Maliki said Wednesday that his government will take measures against an Iranian opposition group, terming it a "terrorist organization." As a first step, al-Maliki said he will ban the People's Mujahedeen Organization of Iran from distributing statements and restrict its fighters from leaving their camp in eastern Iraq. The organization has thousands of members in Iraq, most of them in Camp Ashraf in Diyala province. A U.S. Marine has died as a result of a "non-hostile incident" in Anbar province, the U.S. military said Wednesday. The Marine, who was assigned to Regimental Combat Team 5, died Tuesday, the statement said. A Salvadoran soldier died Wednesday and another was wounded in a bombing near Kut southwest of Baghdad, his country's defense minister announced. It was the third fatality among Salvadoran soldiers since the Central American nation sent forces there in 2003. Sixteen other bodies were found in widely separate parts of the country, apparent victims of sectarian death squads. In Baghdad, Sunni leaders said 20 Sunnis who work for a government organization that maintains mosques and shrines of that Muslim sect were abducted in two areas of Baghdad. 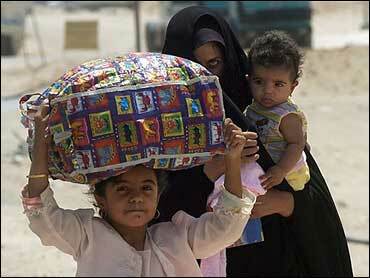 Sunni officials demanded that the Shiite-led security forces do more to stop sectarian kidnappings and killings. There were conflicting reports whether the employees of the Sunni Endowment were seized late Tuesday or Wednesday. The Sunni Endowment announced it was suspending its work for a week to protest the kidnapping and demanded that its employees be freed. The head of the organization, a major institution among the country's Sunni community, blamed "militias in official uniforms" for the wave of kidnappings. The choice of words suggested he was referring to Shiite militiamen who have infiltrated the defense and interior ministries. Sunni Endowment, Ahmed Abdul Ghafour al-Samaraie, told reporters that there will be no work at the endowment's offices for a week in protest against "kidnappings and killings carried out by militias in official uniforms." He was apparently referring to Shiite militias that Sunnis blames for killing civilians. "I call upon the president and the prime minister to set up checkpoints in tense areas to prevent the killings," Sheik Ahmed Abdul Ghafour al-Samaraie told reporters. The kidnapping occurred as part of a wave of sectarian violence which escalated after the bombing of a Shiite shrine in Samarra last February and the July 1 car bombing that killed 66 people in the Shiite district of Sadr City. In a joint statement Wednesday, America's two top officials in Iraq deplored the surge in sectarian violence and called on the Iraqi people to unite against "the terrorists and death squads." Ambassador Zalmay Khalilzad and Gen. George W. Casey also called on Iraq's leaders "to take responsibility and pursue reconciliation not just in words, but through deeds as well." The statement reflected U.S. disappointment that the national unity government, which took office May 20, has faltered in its attempts to win public trust, calm sectarian tensions and convince Sunni-led insurgents to lay down their weapons. Instead, the situation in Iraq has gotten worse. On Tuesday, the United Nations said nearly 6,000 civilians were slain across Iraq in May and June, a spike in deaths that coincided with rising sectarian attacks across the country. Prime Minister Nouri al-Maliki, a Shiite, accused al Qaeda in Iraq of targeting civilians because it is afraid to face Iraqi security forces. He vowed the attacks would not undermine his efforts toward national reconciliation. But deputy Prime Minister Salam al-Zubaie, a Sunni Arab, blamed U.S. and other coalition forces for much of the violence, saying their troops were responsible for about half the deaths due to "raids, shootings and clashes with insurgents." "They came to protect the people and democracy and all the problems we have today are because of them. It is a loss for Iraq," al-Zubaie said. Kurdish legislator Mahmoud Othman said the U.N. report makes clear that if the situation continues, "catastrophe will hit the country." "The U.N. report is a warning to officials and politicians that the situation is very bad and they have to be careful and solve it but the government cannot find a solution," Othman said.